It isn’t every month that Sigona’s has a beverage praised by Oprah Magazine, Fox News, Every Day with Rachael Ray and more. But this isn’t your grandpa’s soda. As Bill Creelman, Founder and CEO of Spindrift Soda explains, fresh, wholesome and deliciously thirst-quenching soda is here to stay. Q. How did you come up with the idea for Spindrift Soda? What was that “A-ha!” moment? A. In recent years, I have been faced with making beverage decisions for my own kids. As I started to look around, I realized that the soda business has virtually stood still in the last 30 years. You can still find the big brands, which often include corn syrup or aspartame, artificial flavors and colors, and a few natural brands, which are derived from water, sugar, and some kind of syrup or concentrated juice. But no one was delivering anything with REAL, WHOLE, FRESH Ingredients. Why couldn’t it be done? Q. I think that when consumers hear the word “soda,” they instinctively think of Pepsi, Coke, etc. Were you nervous about including that word on your product, especially considering the links between typical soda and obesity in America. A. Growing up, my mom did not allow Pepsi or Coke. Soda to me was natural–clear (no artificial colors! ), made with carbonated water, sugar, and some kind of natural flavor. Later in life I developed an addiction to Diet Coke, which contradicted my otherwise healthy lifestyle. I wanted to bring the definition of “soda” back full circle to the delicious beverage I grew up drinking. Spindrift is an excellent alternative to the unhealthy beverages on the market. Obviously, everything is best in moderation. Q. What was your reaction when you saw your product featured in such an influential publication like Oprah.com? A. Seeing Spindrift on Oprah was a very exciting moment. There is a certain caliber of credibility associated with Oprah and we were thrilled to be acknowledged by such an esteemed source. Q. What other creative marketing tactics do you employ to help get the word out? A. Social media is very central to our marketing strategy. The engagement with consumers that social media provides is extremely beneficial. Twitter and Facebook create a constant dialogue and open up the floor for insightful and personal feedback. It’s mutually beneficial– both for the customers and us. Q. Do you have any new flavors or products in the pipeline that you can talk about right now? A. Spindrift Water just launched on the East Coast for Summer 2012. It’s a delicious and refreshing fresh squeezed sparkling water. The flavors are lemon, raspberry lime and tangerine and are all 0 – 10 calories. They are very hydrating and perfect for an especially hot summer – hope to see them out West soon! We are also looking to have some new fresh West Coast flavors in 2013 so stay tuned! Q. Anything else you’d like to let Sigona’s customers know about? A. 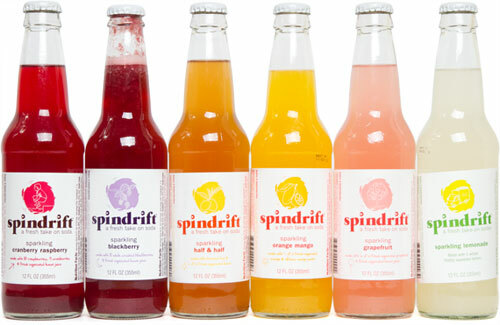 Sometimes there is confusion with the distinction between Spindrift and other “all-natural” sodas on the market. Spindrift is the first completely all-natural, fresh squeezed soda on the market – no syrups, no juice concentrates, no additives, no preservatives. Spindrift is so fresh that it has a shelf life and is delivered alongside fresh produce.